Bali Uluwatu Tours is an Bali Full Day Tour Package to Visit Uluwatu Temple with sunset view facing to the Indian ocean and watching the beautiful Kecak and Fire Dance Performance near the temple. 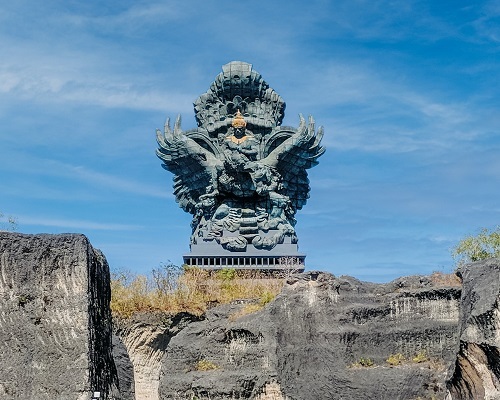 This Uluwatu Tours package will start to visit Garuda Wisnu Kencana Cultural Park planned to be established a landmark or Bali mascot, in the form of a giant statue, that is a statue of Lord Vishnu riding a Garuda bird, then continue the tour to visit the Beautiful Padang - Padang Beach is one of the best white sand beaches, then we continue to visit the main site is Uluwatu Temple is amazing temple sits on 70 meter protuding cliff with some group monkey nearby, then the tour will continue to watching Kecak and Fire Dance Performance near the uluwatu temple, is a Balinese dance takes story from fragment Ramayana, and then the last site during Uluwatu tours is visit Jimbaran beach to enjoy the delicious seafood dinner on the beach at local restaurant. The Uluwatu Tours will bring you to the wonderful memory with three different experiences as the feature of this Full day tour package. Our professional Bali Tours Driver is always outstanding offer our best services to keep your convenience trip along with private full air-conditioning car transfer to complete your enjoyable on Bali Uluwatu Tours.